Last year around this time I decided to make only two resolutions, and both were culinary. The first was making a traditional French Boeuf Bourguignon, which I wrote about here. The second was to try my hand at a classic soufflé. Both were dishes that seemed complicated, but worth the effort. I wanted to learn something new, and prove to myself (and you!) that those recipes (especially French recipes) that seem daunting are not as hard as they seem, and worth the extra time. Well, I didn't get my soufflé under the wire of the New Year, but I figured I could start 2015 off with a bang and set the tone for the rest of the year, at least in the culinary department. 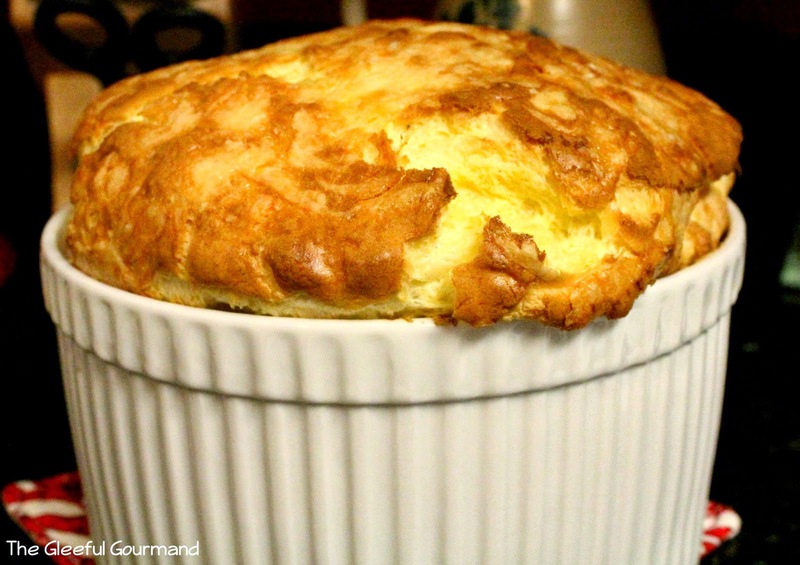 I've always loved a good soufflé, both savory and sweet. And I don't know about you, but I had it in my head that it really was a daunting thing to do. When written about in magazines, it's always with a reverence that revolves around the soufflé's ability to rise to lofty heights. Any dessert that requires you to order it 25 minutes in advance must be pretty serious, right? It was time to find out for myself, and there was only one way I was going to do it: traditionally, or not at all. I once again went straight to the source: Mastering the Art of French Cooking. (Excuse me for a second as I go on a rant here) Let me say, I am absolutely making a point in not calling this "Julia Child's Cheese Soufflé." Call me a stickler for facts, but this book was not just written by Julia Child. True, Louisette Bertholle was a minor player in the first volume (there are two, by the way), and not at all in the second, but Julia Child couldn't have done what she did in this book without Simone Beck. 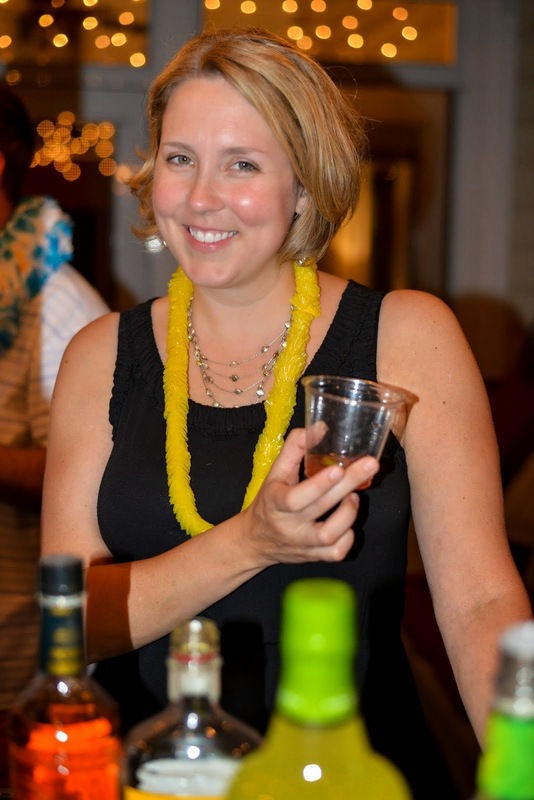 Simca had an impeccable palate, and was famous for tasting something a chef had prepared and knowing exactly what went into it, how it had been prepared, and how to re-create it in the home kitchen. My point is this: The recipes that come out of this book are not just Child's alone. That's what makes a collaboration a collaboration. Without Beck and Bertholle's expert knowledge on French cuisine, there wouldn't have been a book. (Okay rant over) What makes the book so perfect is Julia Child's sensibility woven throughout. She wanted to make all these recipes really work for the "servantless American cook" and to teach them in a such a way so that the knowledge would stick. Not only does it start the whole chapter off by teaching you step-by-step how to whip eggs correctly, but also the techniques of folding, and the correct measurements for any circumstance where your soufflé mold might hold more or less than the recipe requires. They literally thought of everything. And that's exactly what I love about their recipe for Soufflé Au Fromage, or your basic Cheese Soufflé. There's not much guess work. If you follow it exactly, your soufflé will come out perfectly - it will rise. Luckily I already had some good knowledge about what the egg whites should look like going into it, but I appreciated the devotion to making sure the reader knows exactly what it should look like before you stop (and possibly over-whip it): beaten to stiff shining peaks. 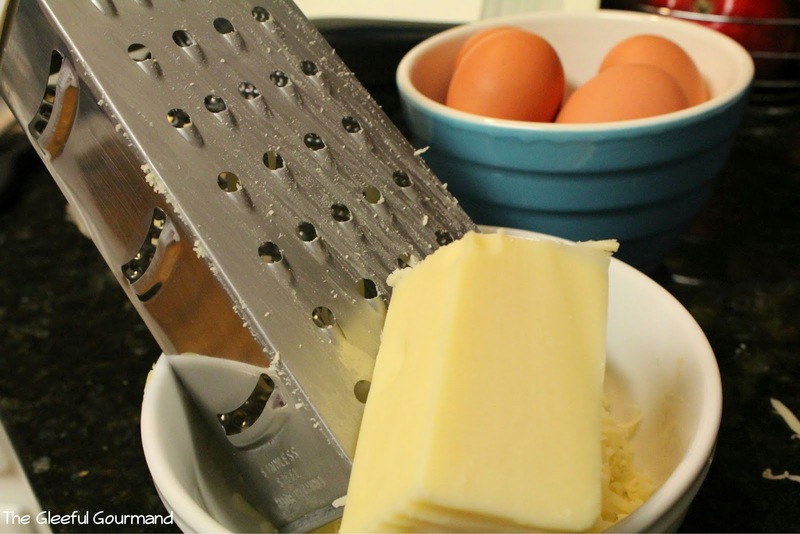 Folding egg whites into the cheese sauce, smoothing the top, and sprinkling more glorious cheese on the top. I loved slathering butter liberally in the inside of the soufflé mold, and sprinkling it with freshly grated Parmesan cheese. This is an important step because as the soufflé rises, the butter and cheese will help it slide up the sides of the mold, and when it's done baking you have these lovely specks of salty Parm studding the outside of each slice. The initial sauce can be made ahead, but it's a bit tricky here to follow their directions word-for-word. French cooking is a delicate dance between balance and time. Making sure your roux doesn't brown before pouring in boiling milk takes timing and adjustment. Even so, mine browned just a bit. My advice is to have every single component you need for each step of the recipe out and ready to go before even starting. Here's another challenge when making a Cheese Soufflé for dinner: Two out of three of my children not only hate eggs, but hate melted cheese (Hello, are you sure you're my children? ), and they wouldn't stop coming into the kitchen, slipping through the hands of my husband who had been tasked with keeping them out to ask me for the millionth time, "What are we having for dinner?" "Good food." And on and on as their suspicions deepened, and I finally blurted out, "Soufflé! We're having Soufflé!" "You've never even had it." It was at this point that they all remembered that one of their favorite episodes of Jake and the Neverland Pirates included a Soufflé monster (just go with it), and they were completely fascinated. I sprinkled the top of the mixture in the mold with a liberal amount of good Swiss cheese (much more than the recommended 1 Tbsp. ), and into the oven it went. We waited with baited breath over the next 25 minutes hoping it would rise...and it did! It was lovely, and glorious, and yes, I felt triumphant. Of course, it started deflating the moment I took it out of the oven, but it didn't fall too terribly far. I served it with a mixed green salad with slivers of oranges and a pomegranate dressing and also star fruit. A nice Chardonnay to toast its lofty, light, fluffy existence. And all of the kids tried it! The one who loves eggs and cheese devoured her whole serving and asked for more. The other two took a couple of bites and then refused it. Luckily I had chicken nuggets on hand, and they also, um, had some deer heart (which is another story for another time). 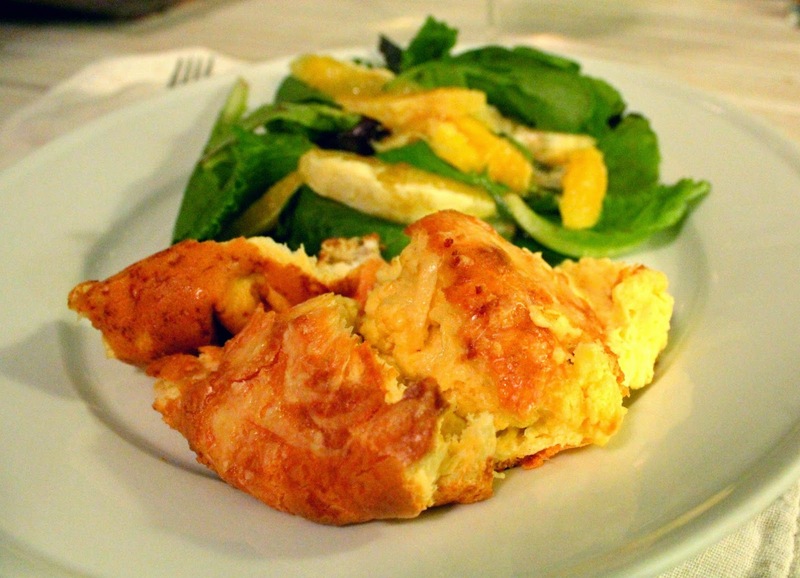 Cheese soufflé paired with a mixed greens and orange salad. The soufflé was delicious. Crispy on top; and like eating an eggy, cheesy cloud on the inside. Next challenge for me? Coq Au Vin. 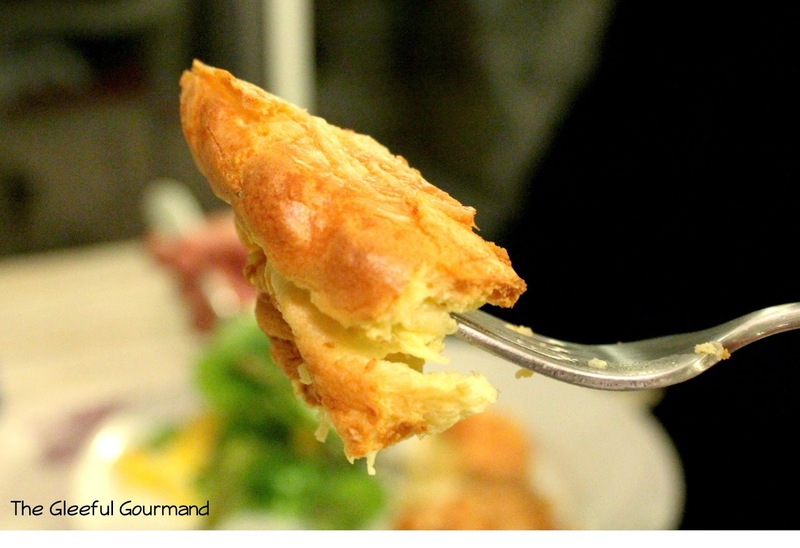 Mastering the Art of French Cooking's recipe, of course. Note: I would like to reprint the recipe here, but not only would I be infringing on copyright laws, but I would also be missing the point. The genius of this recipe is that you learn a lot from it. In order to do that correctly, you really need your own copy of Mastering the Art of French cooking. In lieu of that, you can easily Google it, and find blogs who have taken the time to type out the recipe. Or you can use Ina Garten's recipe which you can find here. Her recipe, though it uses spinach and cheddar (instead of Swiss), is almost word-for-word identical to the one I used, and you won't go wrong. Looks delicious. Will try to make one this weekend. Thanks for your interesting writing as well. Thank you so much for reading! Let me know how it turns out, ok?